The Rosetta mission’s Philae lander descended toward the two-and-a-half-mile-wide comet at a human’s walking pace. For seven tense hours, scientists in Darmstadt, Germany monitored its radio signal. They would have no idea whether they’d done everything correctly until after the moment of touchdown. If all went well, the lander would press two harpoons into the dusty surface of 67P/Churyumov–Gerasimenko, sticking itself firmly in place. If not, well, Philae could bounce right off and be lost to space, or it could be sucked into a pit of soft dust. Nothing interrupted the radio signal at touchdown time, assuring the scientists that the probe wasn’t upside down or mired in dust—Philae was still alive. The researchers relaxed a little. Everything looked as if it had worked according to plan. But the European Space Operations Centre couldn’t decode all of the data, and foreboding news was routed instead to the lander control centre in Cologne, Germany. Scientists there noticed that power generation from the solar cells was oscillating. Philae had not stuck the landing, and it was spinning. 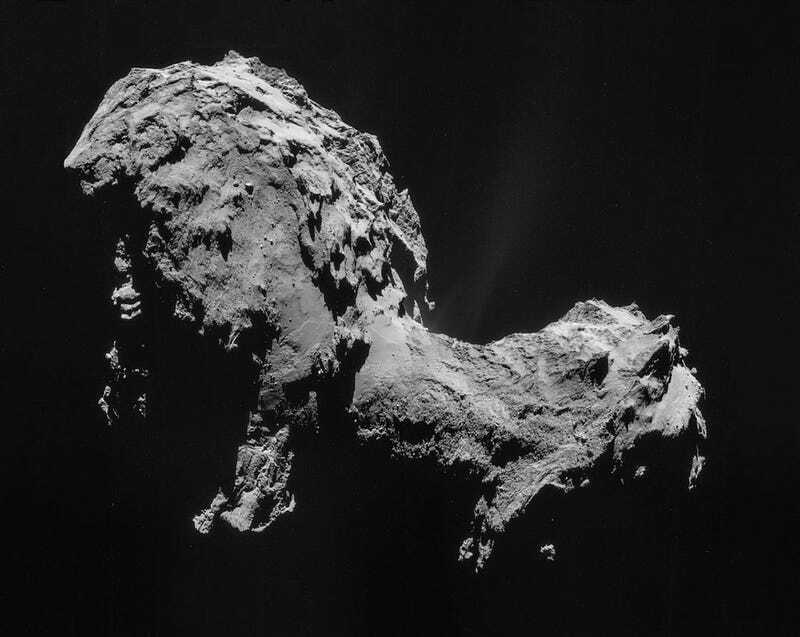 It had bounced—and would bounce a second time—in response to 67P/Churyumov–Gerasimenko’s tiny gravitational pull. Two hours after the attempted touchdown, Philae came to rest in a crack under a big boulder. Was the craft destroyed? Was the mission a failure? “Those two hours, I don’t wish them on my worst enemy,” Paolo Ferri, Rosetta’s mission director at the European Space Agency, told Gizmodo. Ultimately, the November 2014 Philae landing was more or less a success—it was able to execute its tasks in a much more scientifically interesting part of the comet than planned, though it couldn’t collect samples of the comet, since its drill didn’t touch the surface. But the nerve-wracking mission demonstrates the difficulty scientists face in figuring out how to land on these tiny, dusty worlds. Then there’s the simple fact that if an asteroid were barrelling toward Earth, planetary defenders would need to know how it was constructed before trying to deflect or destroy it. 67P/Churyumov–Gerasimenko was a comet, not an asteroid, but the two space rocks present similar challenges: They both feature rocks and dust, have incredibly weak gravitational fields, and are usually on the order of a few miles wide. Back in 2005, Japanese spacecraft Hayabusa damaged itself in a crash against the asteroid Itokawa while trying to collect a sample, before a successful return in 2010. Two new missions are approaching their targets at this very moment—NASA’s OSIRIS-REx is nearing the asteroid Bennu, while Japan’s Hayabusa2, the followup to Hayabusa, arrived in orbit around asteroid Ryugu last week. Meanwhile, companies are in the earliest stages of developing ways to mine asteroids for resources usable for space colonisation. Spacecraft meant to study and take advantage of asteroid resources up close will have to survive the environments of their utterly unearthly hosts. Hayabusa2 and OSIRIS-REx will face worlds completely foreign to those of us used to the comfortable physics of our own planet. They’ll have to rely on the knowledge gleaned from previous missions. 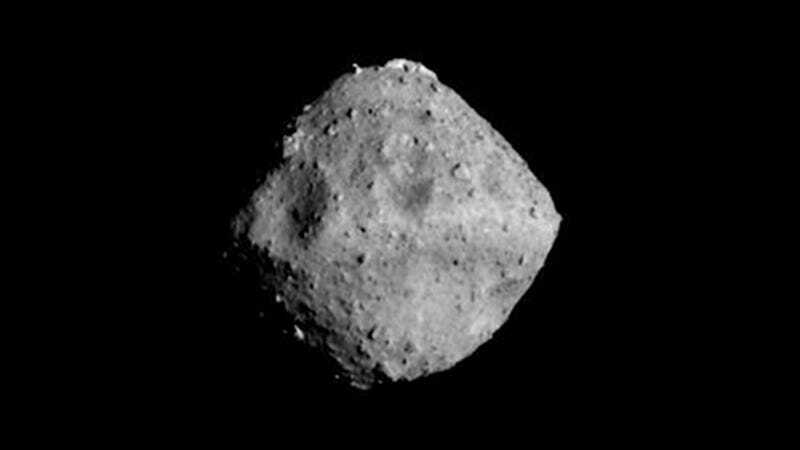 “What we learned from Hayabusa is fundamental for going to Bennu and Ryugu. But there are a lot of unknowns,” Neyda Abreu, associate professor at Penn State University, Dubois, who edited a book on the topic, told Gizmodo. But those first missions were complicated. “It was epic, what Hayabusa did to get some samples,” she said. Hayabusa lost a lander, MINERVA, to the depths of space, and faced its own suspense-filled journey to take samples from Itokawa. It mysteriously went into safe mode during its attempt to land on the asteroid. The touchdown was ultimately successful but required two attempts to collect samples by kicking up dust with a metal pellet. The probe returned to Earth with samples in 2010, the first time such a feat had ever been accomplished. Asteroids are rocks that orbit the Sun and are too small to call planets—the largest known is Ceres, a spherical rock 592 miles wide whose orbit falls between Mars and Jupiter. There are several types of asteroids, grouped based on how they reflect light and their surmised composition. Their surface texture could vary from dust-covered lumps of metal to loosely bound piles of rock floating through space, based on where and how they formed in the Solar System. It’s hard to tell much about an asteroid before you get there, as evidenced by a humorous post on the Hayabusa2 project website in which mission scientists try to guess what their target will look like (“A Karinto puffcream. All the black and round things have come to look like Ryugu to me!”). They can be too dim to see properly with Earth-based telescopes. Kerri Donaldson Hanna, University of Oxford and OSIRIS-REx scientist, explained to Gizmodo that asteroids often look like a single point of light through a telescope. Sure, you can use the spectrum of this light to determine the asteroid’s total composition in general, by trying to find similar materials in the lab that could recreate the observations. But scientists just don’t have much information on how materials vary across an asteroid’s surface until they visit. And once a probe arrives at its target, there are still fairly basic challenges. Even an ideal asteroid for this kind of mission will likely be constantly tumbling and have almost no gravity. Combine that with the fact that the surface might be dusty or covered in loose rocks, and these asteroids can be especially hard to grab onto. Then there are Newton’s laws of physics acting against you—if you try to dig into the surface, you could end up pushing yourself right off. Nor is it just low gravity that’s an issue. What gravity is left is irregular, based on how the object is put together. The comet 67P/Churyumov–Gerasimenko was shaped like a duck, for example. The Rosetta orbiter needed to constantly make tiny adjustments to maintain its orbit, and the closer it got to the comet, the more chaotic things got. Those adjustments made observations difficult by sometimes pointing the probe’s cameras in the wrong place, explained Matt Taylor, a scientist on the Rosetta mission. OSIRIS-REx’s scientists hope to fully understand whether Bennu will someday crash into our own planet. “Studying its properties allows us to model it more closely and rule out whether it could impact the Earth,” Moreau told Gizmodo. On arrival at Bennu, OSIRIS-REx will immediately begin mapping potential places to approach the surface. Then, it will shoot gas at the surface to pick up some rock and catch it. The craft will have three tries to collect somewhere between 60 grams and 2 kilograms of asteroid dust. This visit could give future generations advance notice if Bennu is indeed on a collision course with Earth, as well as help them determine a course of action. With enough warning, perhaps we’d need to nuke the rock, or even paint part of its surface in order to change its orbit enough to thwart a collision. The US National Science and Technology Council recently released a report about how the US isn’t ready for a catastrophic asteroid strike. Other planned projects, including NASA’s Asteroid Redirect Mission and the Double Asteroid Redirection Test (DART) mission, will hopefully facilitate better preparation. Impact risks aside, perhaps the biggest reason we want to land on comets and asteroids is sheer curiosity. Asteroids contain material from early on in the Solar System that hasn’t been altered by the planetary formation process, making them snapshots of the Solar System as it was when it was first forming. Understanding them could shed light on how our own planet came to be. The whole landing-on-an-asteroid thing is clearly challenging. But scientists have some ideas to make it work. For example, some are trying to recreate the conditions of asteroids here on Earth to test landing systems. This autumn, North Carolina State University professor Karen Daniels’ team of undergraduates will fly on a zero-gravity plane, also known as a vomit comet. They’ll jab needles into collections of small beads that record the way forces act on them, and that data could help engineers design a better asteroid-grabbing harpoon. Now that Hayabusa2 has reached orbit around Ryugu, the Japan Aerospace Exploration Agency scientists will begin evaluating potential landing locations. The Hayabusa2 craft will use an on-board impactor tool to blast a crater in Ryugu’s surface so it can gather samples of material from just below its surface. Then, it will drop a few landers that will attempt to collect even more data. 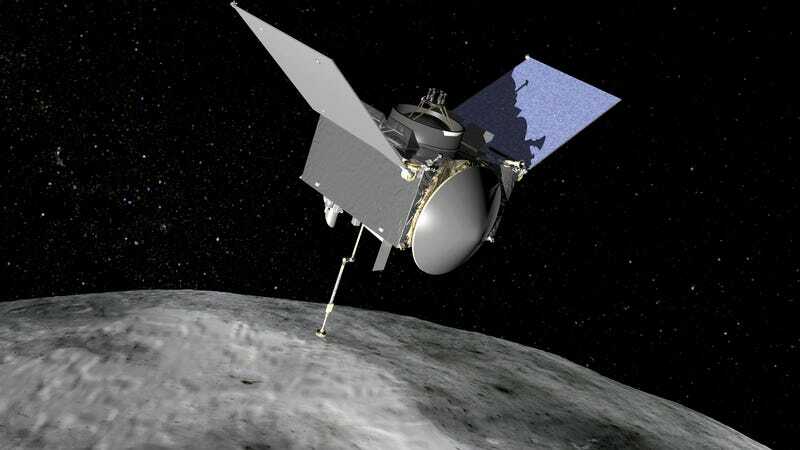 If they are successful, Hayabusa2 and OSIRIS-REx will return to Earth in the early 2020s with samples. In addition to teaching us about those asteroids and our Solar System, studying these samples could help scientists better understand the meteorites have landed on Earth, including where and how they might have formed. But they are moving forward. Planetary Resources this year launched and tested its Arkyd 6 system, a prototype of a satellite that would detect which near-Earth objects have water.